Jimi Hendrix's playing is rooted in the blues and his own take on it is what made his sound so unique and fresh to the time. WIth this turnaround lick, we are going to integrate a new chord voicing into our blues along with some key Hendrix style tricks. Played in the key of C, we will integrate a G augmented chord into the mix; meaning we will play a G chord with a raised 5th (playing a D# instead of a D.) This sound creates a nice jazzy approach, mixed in nicely with Hendrix style chromaticism and vibrato. 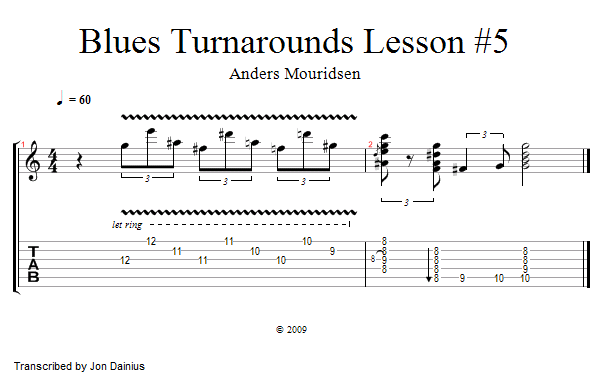 Let's try this example in a slow blues in C; trying it slowly first and than up to speed with the backing track.